Change orientation of one page in Margins 1: Select the entire page that you want to change the orientation, then click Page Layout > Margins and select Custom Margins. 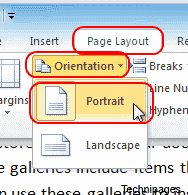 2: In the Page Setup window, select the orientation you need in Oriention section, and choose Selected text in Apply to .... Change orientation of one page in Margins 1: Select the entire page that you want to change the orientation, then click Page Layout > Margins and select Custom Margins. 2: In the Page Setup window, select the orientation you need in Oriention section, and choose Selected text in Apply to .